Hydrogen atoms have 1 electrons and the shell structure is 1. The ground state electronic configuration of neutral hydrogen is 1s1 and the term symbol of hydrogen is 2S1/2. Hydrogen: description Your user agent does not support the HTML5 Audio element. Note that while hydrogen is normally shown at the top of the Group 1 elements in the periodic table, the term "alkaline metal" refers to the Group 1 elements from lithium downwards and not hydrogen. Hydrogen is the lightest element. It is by far the most abundant element in the universe and makes up about about 90% of the universe by weight. 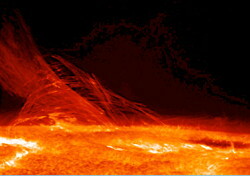 It is also the most abundant element in the earth's sun. Hydrogen as water (H2O) is absolutely essential to life and it is present in all organic compounds. Hydrogen is the lightest gas. Hydrogen gas was used in lighter-than-air balloons for transport but is far too dangerous because of the fire risk (Hindenburg). It burns in air to form only water as waste product and if hydrogen could be made on sufficient scale from other than fossil fuels then there might be a possibility of a hydrogen economy. 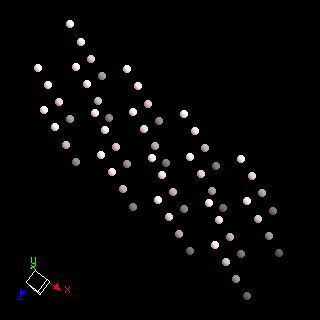 The solid state structure of hydrogen is: bcc (body-centred cubic). Hydrogen makes up two of the three atoms in water and water is absolutely essential to life. Hydrogen is present in all organic compounds. A form of water in which both hydrogen atoms are replaced by deuterium (2H, or D) is called "heavy water" (D2O) and is toxic to mammals. Some bacteria are known to metabolise molecular hydrogen (H2). Reactions of hydrogen as the element with air, water, halogens, acids, and bases where known. Binary compounds with halogens (known as halides), oxygen (known as oxides), hydrogen (known as hydrides), and other compounds of hydrogen where known. Bond strengths; lattice energies of hydrogen halides, hydrides, oxides (where known); and reduction potentials where known. Hydrogen was discovered by Henry Cavendish in 1766 at London, England. Origin of name: from the Greek words "hydro" and "genes" meaning "water" and "generator". 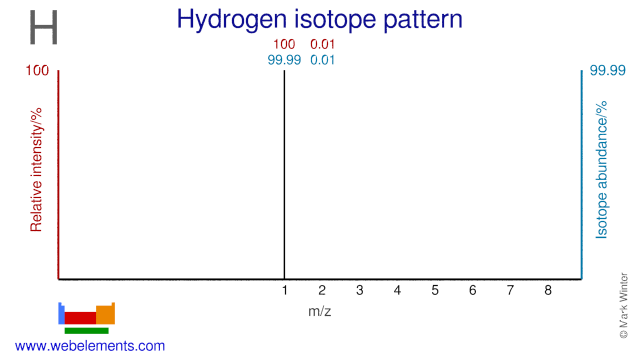 Isotope abundances of hydrogen with the most intense signal set to 100%. The Hydrogen isotope H-2, also known as deuterium, is used in a variety of applications. Deuterium is used extensively in organic chemistry in order to study chemical reactions. It is also used in vitamin research. Deuterium in the form of H2O, known as heavy water, is used as a moderator in CANDU nuclear reactors, in NMR studies and in studies into human metabolism. Heavy water is also applied in the Sudbury Neutrino Observatory where it is used to study the behavior of neutrinos. Isolation: in the laboratory, small amounts of hydrogen gas may be made by the reaction of calcium hydride with water. This is quite efficient in the sense that 50% of the hydrogen produced comes from water. Another very convenient laboratory scale experiment follows Boyle's early synthesis, the reaction of iron filings with dilute sulphuric acid. There are many industrial methods for the production of hydrogen and that used will depend upon local factors such as the quantity required and the raw materials to hand. Two processes in use involve heating coke with steam in the water gas shift reaction or hydrocarbons such as methane with steam. In both these cases, further hydrogen may be made by passing the CO and steam over hot (400°C) iron oxide or cobalt oxide.